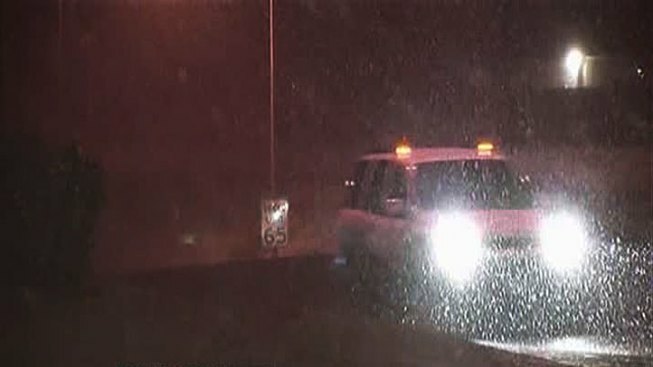 Road crews in North Texas geared up Monday morning, in case the wintery-mix made the commute slick for drivers. NTTA workers were ready to roll out if needed. Crews loaded up the trucks with sand all morning and were stationed up and down the Dallas North Tollway. The snow started falling in Dallas near Royal Lane around 5:25 a.m. and lasted about a half hour. Some snow did accumulate on the grass, but quickly melted. The snow didn’t pile up on the tollway, however it did makes the roads wet. TX-DOT says the ground temperature stayed warmer than the air temperature and did not make the roads icy. Crews stocked up with sand and were prepared to treat the interchanges, bridges and overpasses. This year, the NTTA is using darker sand, which makes it easier for drivers to see. Crews spread the sand, then put down a liquid chemical. The mixture is more expensive, and why many cities only use sand or a sand-salt mix. TX-DOT says it costs around $40,000 per day to treat highways in Tarrant County with the de-icer, “Meltdown 20” brand magnesium chloride. NTTA has more than 100 trucks, nine plows, and about four million pounds of sand ready to go. Snow plows were quite a novelty when they first showed up in North Texas around the 2010 Superbowl, when the area did have some serious snowfall. NTTA said it’s been preparing for snow and ice, since the triple-digit heat of the summer. Maintenance staff participated in a “snow and ice rodeo” the end of October to prepare for possible upcoming wintry conditions on the NTTA roadways. Classroom training included plan review and equipment training for crews. Crews also drove assigned routes and checked maps for accuracy. Additional training sessions were scheduled approximately every two weeks.